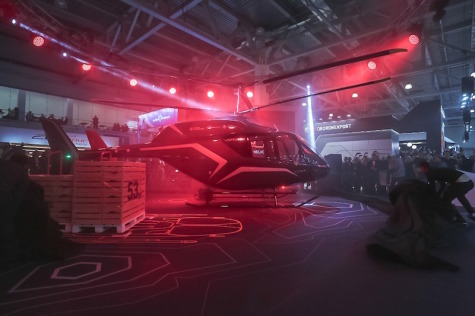 MOSCOW --- Russian Helicopters (part of Rostec State Corporation) presented for the first time the light multirole VRT500 helicopter developed by the VR-Technologies design office in cooperation with the international engineer team at HeliRussia-2018, the International Helicopter Industry Exhibition. The VRT500 will become the first holding's helicopter in the segment of light helicopters with takeoff weight up to 2 tons. Now, aircraft of this type amounts to 18% of the world helicopter fleet. "We see the interest in the project both from Russian and foreign operators. Agreements on strategic partnership have already been signed as part of the program on promotion of the helicopter on international markets. We estimate that by 2035 we will sell about 1,000 helicopters, which will allow us to take up to 15% share of the world segment of light helicopters with weight up to 2 tons. Market analysis shows it is this helicopter class that will be the most large-scale," said Andrey Boginsky, CEO, Russian Helicopters. These days, specialists from the holding company conduct structural tests of the carrying system. Aerodynamic tests are planned in the short term. "We enter the market of light helicopters with weight up to 2 tons for the first time in many years. This market is very competitive, which forces to increase requirements for quality, reliability and capabilities. The VRT500 has excellent performance which with the keen price should lead to success of the helicopter both on domestic, and foreign markets," said Anatoly Serdyukov, Industrial Director, Avaition Cluster of Rostec State Corporation. The VRT500 is a light single-engine helicopter with coaxial propellers and 1,600 kg of takeoff weight. The aircraft will have the largest passenger and cargo cabin with total capacity of 5 people and will be equipped with a modern interactive avionics complex. The performance of the helicopter will allow it to speed up to 250 km/h and have up to 860 km of range and up to 730 kg of useful load. The helicopter is planned to be supplied in passenger, multirole, cargo, training, VIP and HEMS configurations. The VRT500 will be the first HEMS up to 2 tons helicopter in the world, which enables to load and offload a standardized gurney through rear cabin doors. It facilitates the whole process and allows to save time.